In blaming inequality on immigration, this millionaire has taken hypocrisy to a new level. A lot will be written about Boris Johnson’s speech on Brexit at the JCB staff HQ (a firm owned by a Tory donor). But while he derides May’s Brexit deal and makes yet another bid to be leader of the Conservatives, it’s his comments on inequality that really stick in the throat. “Yes [Brexit] was about democracy… but that vote, was also triggered by a feeling that in some way the people of this country has been drifting too far apart and in areas where we need to come together. It’s hard to know where to begin when it comes to the blond buffoon’s latest outburst. “Factors like employment and skills policy, trade union coverage or the minimum wage level have all been shown to be much more important in determining pay in the UK than immigration, which has had a pretty trifling impact on wages. But there’s another issue with this speech: Boris is only concerned about sky-high pay when it suits him. Using inequality to make an anti-immigrant argument is beyond rich (pun intended) from a man who earns £275,000 a year for one article a month at the Telegraph. What would low-paid reporters at the paper make of his sudden concerns over inequality? The Telegraph has spent years laying off hard-working reporters….while dishing out hundreds of thousands of pounds to this Tory chancer. Someone who was already earning over a million pounds a year. 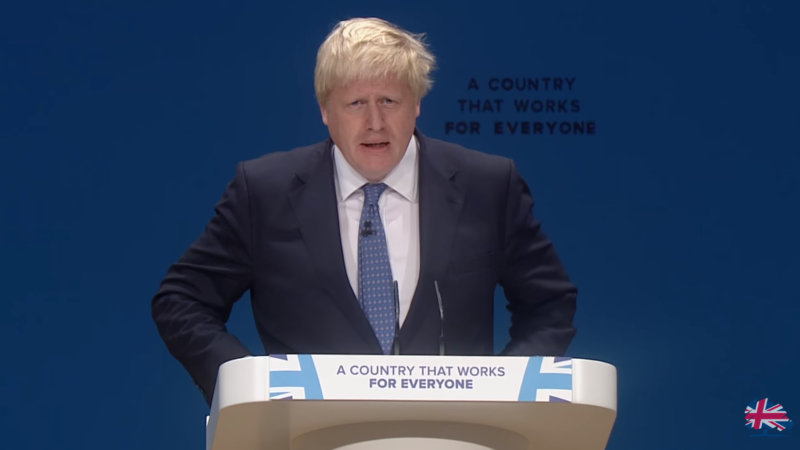 Free marketeer Johnson’s vision of Brexit is a bonfire of regulations – rules that protect workers’ rights and their power to challenge powerful corporations. Trade unions have called him out for this time and time again. Speaking of which, he has frequently called for even tougher rules to undermine trade unions’ ability to defend workers – arguing the government should pursue a ‘Thatcherite zeal‘ against workers’ organisations. Last year he demanded sweeping tax cuts for the rich: “We should be looking not at rises but at cuts to income tax, capital gains tax and stamp duty.” Capital gains tax is a key bulwark against inequality, kicking in when companies and individuals get a financial windfalls when selling assets. (In the same speech, he railed against potential tax rises to fund much-needed investment in our health service – despite them being backed by voters). Johnson has defended tax-avoidance by multinational companies such as Google – arguing it is their duty to avoid tax. Though he has, of course, flip-flopped on this issue, too. He says the country has been ‘drifting apart’ when it comes to pay. This from a man who has derided the £140,000 a year Cabinet salary he received as ‘not enough to live on’ and his Telegraph salary as ‘chicken feed’. At least Johnson’s latest outburst against inequality is better than his previous defence for it. In the past he has claimed low pay was down to people’s ‘low IQs’. (He later failed a live IQ test) – while praising inequality for fostering a ‘spirit of envy’. For him, that’s a good thing for a country to have. in Boris’ world, greed is good – unless it can be used as an argument to bolster his hard-Brexiteer ideology.